The charity Invest in ME has provided a truly remarkable opportunity to address one of the biggest medical scandals in history and to remove what in 2007 Alex Fergusson, Presiding Officer (Speaker) of the Scottish Parliament, referred to as “the cold grip of psychiatry” on myalgic encephalomyelitis (ME), which he said was “still far too deeply rooted in the world of ME” (http://www.meactionuk.org.uk/Defiance_of_Science.htm). 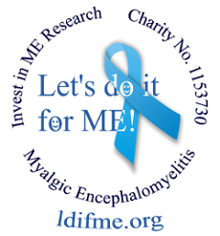 Invest in ME are at the forefront of international biomedical research and have by sheer determination and effort managed to put things in place for a trial of rituximab to begin on ME patients in the UK. They recognise the urgency of the situation and know that many ME patients do not have the luxury of time. The charity already has the facilities in place, including suitably experienced researchers (Professor Jo Cambridge is now principal researcher at UCL, and the ME trial will involve the same team working under her that carried out the rituximab research in RA). Invest in ME have been told this trial could start relatively quickly if the charity had funds available. Such an opportunity must not be lost. However, this will not happen without substantial funding. We therefore ask everyone who is able to do so to donate whatever they can afford, in order that the UK rituximab trial can get under way as quickly as possible whilst the excellent facilities and committed staff at UCL and the active support of Professor Edwards remain available, so that ME can finally be recognised as the devastating multi-system neuro-immune disease that it is and – most importantly -- so that sufferers may at last have some hope of alleviation of their suffering. If the rituximab project does not go ahead for some reason then the funds raised will be transferred to the IiME Biomedical Research Fund to fund other biomedical research projects which are attached to our proposal for an examination and research facility based in Norwich Research park in Norfolk, UK. These funds will only be used for biomedical research into ME. Invest in ME wrote in their Facebook group: Thank you Margaret Williams and Professor Hooper. Lovely endorsement from those to whom the ME community will be eternally indebted. From the team at LDIFME: Our grateful thanks to Margaret Williams and Professor Hooper for their unwavering advocacy for people with ME and for this clear statement of support.